Marry Me a Little, a musical revue born in a tiny Off-Off Broadway theater, brought a selection of Stephen Sondheim’s songs to the stage for the first time. During rehearsals for Sweeney Todd, he happened to mention the existence of some unperformed songs to one of the chorus members, Craig Lucas. When Lucas was commissioned to put together a musical revue for The Production Company, he reminded Sondheim of the conversation and asked permission to use some of these songs. Skeptically, the composer gave Lucas the go-ahead, and together they chose seventeen songs. 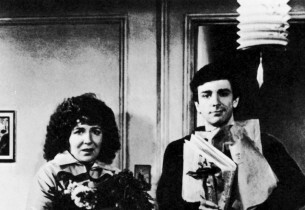 Marry Me a Little opened at The Production Company on October 29, 1980, and later moved Off-Broadway to the Actors’ Playhouse. With ingenuity and imagination, Lucas and director Norman Rene developed a story about two single people in New York who find themselves alone on a Saturday night. Because the revue was performed on the set of another play running at The Production Company, the characters were developed as young people moving into their first studio apartments, one above the other. As a stage convention their apartments are merged into one. Although the characters, portrayed by Suzanne Henry and Craig Lucas, never meet, they function in each other’s dreams or in counterpoint. How the young man and woman spend the evening alone – and how they feel about it – is related entirely through their actions and the songs. For the diligent fans of musical theater trivia we respectfully offer the following background on this collection of songs: “Saturday Night,” “So Many People,” and “A Moment with You” were all written in 1954 for what would have been Broadway’s first taste of Stephen Sondheim. The story goes that he and Lemuel Ayers were both ushering at a wedding. Ayers, who had produced, among others, Kiss Me, Kate and Out of This World and was also the leading set designer of the day, was looking for a composer and lyricist to musicalize a play called Front Porch in Flatbush by Julius J. and Philip G. Epstein, the authors of Casablanca. Sondheim auditioned and got the job; the show became Saturday Night. Eight backers’ auditions were held before Ayers died unexpectedly of leukemia, and Saturday Night died with him. “Pour le Sport” was written in 1956 for another abortive effort, The Last Resorts. Cleveland Amory had written a book by that name: Hal Prince bought the rights to the title, then commissioned Jean Kerr to write a script, using only the title. This became the story of a wry, laconic Hoosier journalist observing the foibles of the Floridian well-to-do as they entertain the Duke and Duchess of Windsor. Sondheim auditioned his songs for Jean and Walter Kerr, who, apparently, were not quick to recognize their merit. Though the show itself never got off the ground, this song was performed in one of Julius Monk’s early revues at the Upstairs at the Downstairs. Sondheim was not long for obscurity. By 1957 he was represented on Broadway as both lyricist and composer. The lyrics, of course, were for West Side Story. During a conference for that show the producer Cheryl Crawford drew Sondheim aside and asked if he’d be interested in writing incidental music for a new play by N. Richard Nash, The Girls Of Summer; to star Shelley Winters, Pat Hingle and George Peppard. The answer was yes. Peppard, who played a musical instrument, was to perform the music onstage at some point. Lyrics were needed for possible promotional ads on the radio, and Sondheim wrote the title song with Lena Horne in mind. A Funny Thing Happened on the Way to the Forum was not a big hit out of town. Sondheim claims that all the songs, save one, were received nightly with enormous apathy. The original actress playing Philia sang a quarter-tone sharp and the actor playing Hero had a beautiful voice that you couldn’t hear past the fifth row. When the two of them were fired in New Haven their songs went with them, including “Your Eyes Are Blue.” “There Won’t Be Trumpets” was cut after the first preview of Anyone Can Whistle. Arthur Laurents had written a monologue for Lee Remick that led into the song: unfortunately, the monologue got a bigger hand than the song, and as both were expressions of the character’s anger, it was a question of which was more effective. But what a song to have to lose. “Being Alive” from Company had several progenitors. The first was set aside in the pre-production phase. 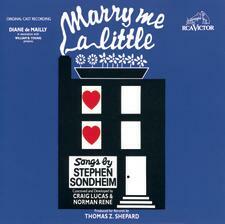 The second, “Marry Me a Little,” was felt to be too self-knowing for the character of Bobby. If he could be so perceptive about himself, then why was he in such trouble? The third, “Happily Ever After,” went into the show and was tried out in Boston. Harold Prince, however, felt the song was too sour a note to end the show with and that the same thought could be expressed optimistically. Hence “Being Alive.” “All Things Bright and Beautiful” comes from an early draft of Follies, at that time called The Girls Upstairs, and was dropped some time before Harold Prince came in as producer/director. When the show opened in Boston, the prologue sequence needed reworking, and Michael Bennett, choreographer and co-director, asked Sondheim to play through all the discarded music. When he heard this melody he found what he was looking for. “Uptown, Downtown” was written two days before the Boston tryout of Follies, and Bennett therefore had very little time to stage it. As a result both he and Prince took a dislike to it, and Sondheim wrote another song, “Lucy and Jessie,” that used a similar rhythmic structure and said more or less the same thing. “It Wasn’t Meant To Happen” also comes from an early version of Follies. It was a song of seduction in the guise of regret, sung by an ex-chorus girl to the lover she had not seen in 20 years. “Little White House” and “Who Could Be Blue?” were written for the Loveland sequence in Follies as a double duet for the four principals’ younger selves. (A second chorus of “Little White House” gave a realistic and unpleasant view of the future to counterbalance the idyllic one.) Prince and Bennett, however, found “Who Could Be Blue?” too “lugubrious,” so the songs never got into rehearsal. (They were replaced by “Love Will See Us Through” and “You’re Gonna Love Tomorrow.”) Sondheim salvaged one of the tunes, however: “Who Could Be Blue?” shows up in his score for the movie Stavisky. The music for A Little Night Music, including the cut-out songs, is among the most sophisticated and accomplished ever written for a musical. No spot could be found for “Two Fairy Tales.” It was intended to go into the first act, for the characters of Henrik and Anne, but prolonged the action where the action couldn’t take prolonging. By the second act the action had become much too urgent and/or farcical to take another ruminative stretch, and so the song was discarded during rehearsals. (Those with sharp ears and a knowledge of the score will notice that the tune is Fredrika’s piano exercise.) Harold Prince wanted to drop “Silly People” the first day of rehearsals, rightly maintaining that no one was going to be interested in what the character of Frid had to say about anything. But in deference to Sondheim the song was left until out-of-town previews. “Bang!” was written to be sung as a duet between the Count and Desirée, but Prince felt that Desirée should not be in the song, and once she was removed, nothing could make it work. By the time the show got to New York “Bang!” was gone and “In Praise of Women” was in its place.